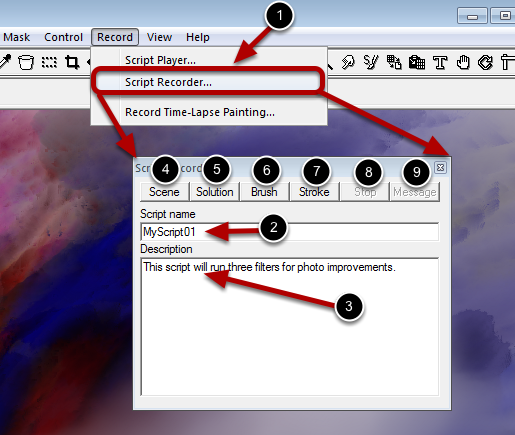 The Script Recorder is used to record and save scripts. The Script Recorder is accessed from the Script Recorder item of the Record menu. The Script Name field must be entered. This will also be the file name for the script. An optional description can be entered. This will appear on the Script Player panel when the script name is selected. The Scene button is used to start recording a new full image recording. Your current page contents will be cleared when this mode of recording is started. The Solution button is used when recording scripts that will be will be used as a solution. A solution recording is different from the other modes because all recorded actions when played back will be proportional. The means that actions during playback will be scaled depending on the size of the page that is currently loaded. This option is also valid for scripts that will be played back in Batch Processing. The Brush button will record paint strokes with the current brush. When played back the brush active at the time of the recording will be used. This option is also valid for scripts that will be played back in Batch Processing. The Stroke button will record paint strokes and not record the current brush. When played back the recorded stroke will play back with the brush that is currently active. This option is also valid for scripts that will be played back in Batch Processing. The Stop button is used to stop a recording. The Message button will display a dialog where a message can be entered that will popup during playback.